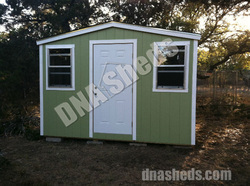 Our sheds are tough, and last and we build on your property. We would even venture to say they are better than tuff sheds. Have you looked into the do it yourself shed kits from Home Depot and Lowes? We offer an affordable solution and built for your on your lot. We service Driftwood, Dripping Springs, Kyle, Buda, Austin, Round Rock and surrounding areas. Be sure and check our our Pricing Page and Pictures, see what we are all about.